Surely you more than once, surfing the Internet, came across animated pictures of flash games, and undoubtedly, you watched the video in the global world wide web. Did you know that most of the clips on the Internet are reproduced (i.e. available for viewing) precisely due to the Flash Player technology? It follows a simple conclusion: In order to comfortably watch videos, play most games, you need your device to support this format..
For the record: Flash Player technology was developed and first used by the popular Adobe company. This company is known for such currently indispensable programs as: Adobe Photoshop (image processing program), Adobe After Effects (program for creating special effects on video). If you are a happy owner of a tablet computer based on Android (2,3,4), then, unlike users of iOS devices, Flash technology is available to you and you can connect it to your device right now. To do this, you need to download and install on your device a special player that will allow you to successfully use Flash technology. In the following instructions, everything is detailed and, I hope, clearly written. You can download the Adobe Flash Player on a special, official website, the official website, so you can not be afraid of viruses. On the proposed resource, you can choose for yourself a player that is ideal for your version of the Android operating system (2,3,4). Using the player, absolutely, for free, you can download and install it freely. Attention: you do all subsequent operations with your device at your own peril and risk; the site administration does not guarantee you the operation of the software downloaded from a third-party site. Before installing the proposed software, weigh the pros and cons. In order to download (remember that downloading is free), you need the version of Adobe Flash Player, go to the proposed link (you can go from a regular desktop PC and download the program, then add it to your device or click on the link from Android (2,3,4) device and download the program immediately to it) - link. After you click on the link, on the page that opens, you will need to select your version of the Android operating system (2,3,4) and click on the corresponding link. After you download the required file (you can download it from the link above), you will need to install it on your Android (2,3,4) device. The process of installing an application for each Android (2,3,4) device will be different, so it makes no sense to describe this process. After installing the player on the device, you need to configure your browser so that, by default, it uses the installed player to display Flash objects. It's important: Flash Player will not work (install in the browser will not work) in the Google Chrome browser. This is due to Google’s policy. Therefore, if you need Flash, we recommend using any other browser. Open the browser you are going to use, then go to its settings and tick off the item that is responsible for displaying Adobe Flash Player. That's it, now your browser supports flash technology. That's all for today, do not forget to leave your opinion on the material in the comments to this article.. 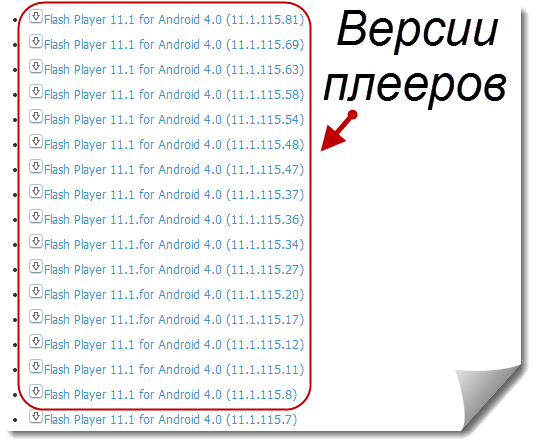 There is one important nuance of the automatic update of Adobe Flash Player in Windows. It is connected with the fact that a regular system service, Task Scheduler, is used to check for updates.